Nanda astami is a festival celebrated to worship Nanda Devi, the highest peak of western Himalayas. This festival presents a remarkable example how association of religion with forests can lead to conservation of our forest resources. This festival is about harvesting of the sacred flower, the Brahmakamal (Saussurea obvallata) and is celebrated toward the end of August. S. obvallata is well known for its use as medicine, food, fodder, fuel, and for ornamental and religious purposes. This festival is celebrated in the Johaari community settled in the Johar valley of the Gori Ganga river in Uttarakhand. 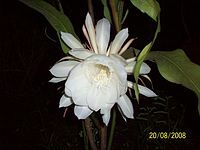 On the festival day, two people are sent to collect the brahmakamal from Salang Gwar, a sacred patch of the forest where these plants are found. The ritual demands that only two individuals be sent. These two individuals take a sacred bath, go to the forest dressed in white, offer due prayers and begin the collection of the flowers of brahmakamal. Only fully opened and mature brahmakamals are collected. Nanda astami tradition presents a unique example of how the conservation can be achieved by associating it with religion. In this case, a fixed day of the celebration ensures that flowers are collected only after the flowering and the shedding of seeds by the species has taken place, and hence collection of the same does the least damage to the propagation of this plant. Also the restriction imposed on the number of harvesters is an effective means to restrict the size of the pool harvested.